The NYSACRA Balancing Incentive Program (BIP) Grant is an opportunity for 20 individuals in New York to access the efficacy of using technology, providing outcomes for more efficient support. Technology supports such as the SimplyHome System, Medication Dispenser and Telehealth Suite enable new options for independent living for these clients. Because the technology has non-invasive solutions, SimplyHome technology engages local, familiar and natural supports so they can be available when they’re needed, instead of being at a site all the time just in case there is a need. The following data was collected over approximately four months. Even in the short-term, success can be gained when we allow individuals options and choices for the way they want to live. The potential total savings for these 20 individuals over a four month period (this includes the SimplyHome System, Medication Dispenser and Telehealth) is $119,880 or approximately $1,500 per person, per month. What it does: By communicating with multiple sensors to observe activities of daily living, the SimplyHome System proactively alerts caregivers and loved ones of changes in behavioral patterns. Text, email or phone alerts are generated when concerning events happen or don’t happen. Two individuals sharing a residence are using a SimplyHome System. Each client has a panic pendant and bed pad. Seven separate events triggered immediate alerts to staff of potential issues for the residents in their home. This included smoke in the home, doors opening late at night and clients requesting assistance from staff. In four months, one individual pressed the panic pendant 12 times. The data also showed staff how frequently one client was leaving bed during the night, allowing the client to manage evening routines and self-care more effectively. What it does:SimplyHome’s Medication Dispenser is a tamper-proof, programmable device that can dispense pre-filled medications up to four times each day. Should the client not access their medication at the proper time, the dispenser can send an alert to the individual, support staff or natural supports through a phone call, text message or email. Seven medication dispensers were used during this four month study, with a total of 1,048 dispensing times. 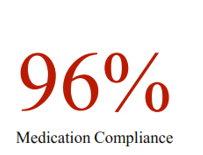 The systems showed a 96% compliance with accessing medications at the proper time. New levels of independence were gained by the individuals being able to now access medication on their own. It also gave family and staff peace of mind that should the individual miss a dose, they can be notified. What it does: These wellness tools offer remote monitoring of blood pressure, blood oxygen, glucose, body temperature, and weight. Readings are collected automatically in the home through a wireless connection to the SimplyHome Hub. The highly trained care staff center has oversight from a registered nurse for targeted interventions of readings outside of a predefined range. Monitoring Blood Glucose: Custom Range for the client is 70 – 200. 45 total readings received over a four month period. 12 of the 45 total readings indicated glucose levels were outside of the custom range, issuing 12 call center interventions. For this client, staff was engaged on approximately 9% of the total readings, whereas in the past they most likely would have been involved on all 45 readings, despite the glucose levels being in a normal range for the client. To learn more about SimplyHome, request more information or email us at Info@simply-home.com.